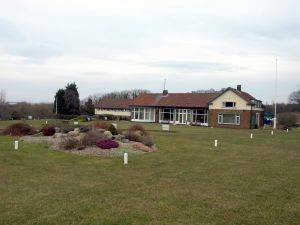 One of the oldest parkland courses in the North East Of England, Wearside is among a small number of golf clubs in Britain that start with a par 3 and finish with a par 5 travelling away from the clubhouse. This demanding course guarantees to provide picturesque views, and a friendly welcome, giving you a memorable visit to the Golf Club. Cox Green - The 1st hole is a par 3 of 172 yards. Most players will hit a five or six iron looking to avoid the bunkers on left and right. A good approach shot is required with the green sloping downwards left to right. 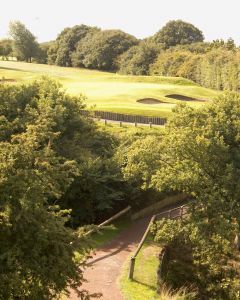 Railway - The 2nd hole is a par 4 of 371 yards. 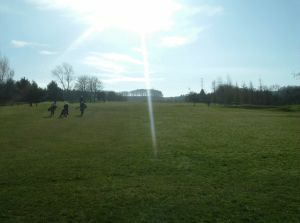 Out of bound runs all down the right hand side that gives you a daunting tee shot early in the round. The fairway is generous but three bunkers are there to catch wayward shots, miss these and you are playing into one of the largest greens on the course. 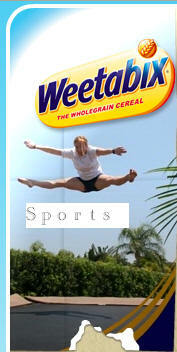 Sponsored by - WATSON ROPES LTD.
From the tee you have a reward versus risk decision. The hole dog legs right and if you can carry your drive about 260 yards you can take it over the corner of the dog leg leaving you with a long shot into a very accessible green. The far right wind turbine in the distance, is a good line to follow. Playing the hole conservatively can bring tree trouble into play on both sides of the fairway. 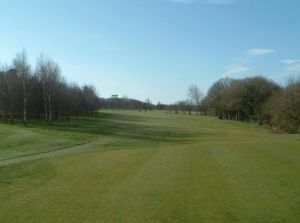 Offerton - The 4th hole is a par 4 of 347 yards. Again, out of bounds runs down the right hand side, with trees lining the left of the fairway and a strategically placed bunker on the right. You need to hit the fairway. Do this and you have a second shot to the largest and longest green on the course, which is protected by out of bounds right and behind, and a bunker front left. The Red House - The 5th hole is a par 5 of 570 yards. This is a very daunting hole from start to finish. A good tee shot is aimed at the red farmhouse in the distance. Trees, a bunker and out of bounds guard the right of the small fairway and trees on the left. Unless you have a death wish don't go for the green in two. If you have missed all the trouble your second/third shots are to a newly made, raised green that is narrow in depth but still quite large. These shots should be more directed to the farm stables adjacent to the right of red brick farm if you cannot see the green as the hole bends left to right the nearer you get to the green. This new green slopes from left to right, with a large bunker and out of bounds behind and bunkers front right and front left, very demanding but very pretty with the River Wear running behind the green. Monument - The 6th hole is a dogleg par 4 of 400 yards. Another daunting tee shot. With trees everywhere you think where is the fairway? Aim at the very picturesque Penshaw Monument and a decent strike finds it, sloping left to right. When this instruction was given to Professional Peter Tupling, he was reputed to have said, 'Yes, but which pillar?' Your second shot is to the smallest green on the course, built into a hill sloping left to right toward the river and a 30 ft. drop on the right behind the seventh tee. You may be forgiven if the term "postage stamp" comes to mind. Wear View -The 7th hole is a par 3 of 160 yards, one of the best in the area. Water, water everywhere! Your tee shot must carry 130 yards over a valley and stream to the green protected by bunkers right and left, with grass mounding that makes it very difficult to get up and down. The hole is a very tough par 3, but oh so pretty. 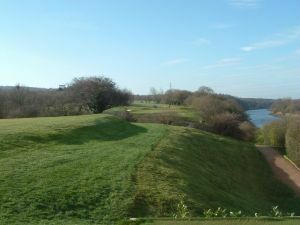 This hole has become well known throughout the region as the Golf Club's signature hole, particularly after it had appeared on Tyne Tees Television in a golfing program. 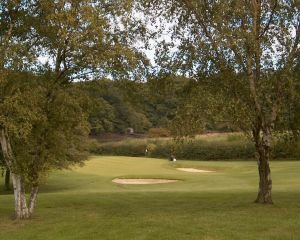 High Marley - The 8th hole is a par 4 of 375 yards. It doglegs left to right with a fairway sloping in the same direction with strategically placed trees to catch the wayward tee shot and out of bounds along the right hand side. A well-placed tee shot will be aimed at the electricity pylon to the right of Penshaw Monument. Your second shot will almost certainly be from a hanging lie. The green is quite large, protected by bunkers right and left, a good hole. 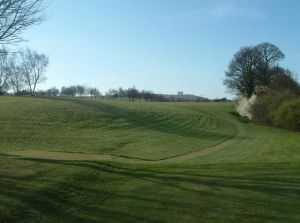 Grimestone Banks - The 9th hole is a par 4 of 339 yards. Trees line both sides of one of the tightest fairways on the course giving you a tough tee shot. The fairway runs uphill for 60% of the way so if you are not long enough you are faced with a blind second shot to a green protected by mounding on both sides, but clearly indicated by the large marker post behind the centre of the green.